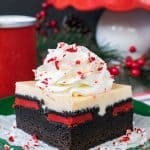 Layers of homemade brownies and a no bake peppermint cheesecake make this Peppermint Brownie Trifle an impressive dessert to bring to holiday parties. *Like these recipes? Sign up for the BruCrew email and have them delivered to your inbox. A few years ago we visited my family over Thanksgiving. We were able to stay at my sister’s house while we were there, and it was fun to catch up with her over those few days. And of course seeing our little niece and nephew was a treat because they are getting so big, so fast. While we were there, we made a batch of Chocolate Cherry Chunk Cookies and talked dessert. Surprise, surprise. I still like to make and talk dessert even when I’m not home. While we were talking she asked me about making a no bake cheesecake. Apparently, she had been craving one and tried to put one together using the ingredients in her fridge instead of what the recipe called for. She thought she could use milk in place of whipping cream. Silly girl! I had quite a laugh at her expense. It’s ok. She was totally laughing too! 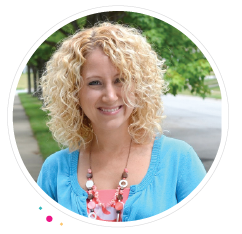 Just so you know, milk cannot be used in place of whipping cream for a no bake cheesecake! My sister found that out when she went back hours later to see if her cheesecake had set up. However, I gave her props for improvising and freezing the runny mixture. 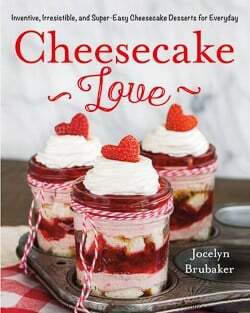 She said it was kind of like an icy frozen cheesecake and got her past her craving. I usually have tubs of Cool Whip in my refrigerator for cheesecake instead of whipping cream. Yes, I know. The white stuff that some people find so controversial is always in our house. Hey, I like the creamy stuff and have been known to eat it by the spoonfuls. #justkeepingitreal If you want to make a homemade, stabalized whipped cream to use in place of the Cool Whip, that will work too. I came home from visiting my sister and whipped up a creamy no bake peppermint cheesecake because apparently my love for peppermint has no end. Then I made these Homemade Chocolate Chip Brownies, minus the chocolate chips and layered the two together in a bowl. A store bought brownie mix works just as well too, if you were wondering. No wonder all that working out early in the morning isn’t doing anything. My sweet tooth is sabotaging my squats…one bite at a time! Beat the eggs, sugar, and vanilla until light and fluffy. Stir in the flour, salt, baking powder, and butter mixture. Pour the mixture into a greased 9×13 pan and bake for 30 minutes. Let the brownie cool completely before cutting it into 1-inch squares. Beat the cream cheese, sugar, and extracts until creamy. Place the peppermint crunch chips and some shortening in the microwave and heat for 30 seconds. Stir until melted and creamy. You may need to heat again for 15-20 seconds. Mix the melted peppermint into the cream cheese mixture. Fold in Cool Whip and more peppermint crunch chips. 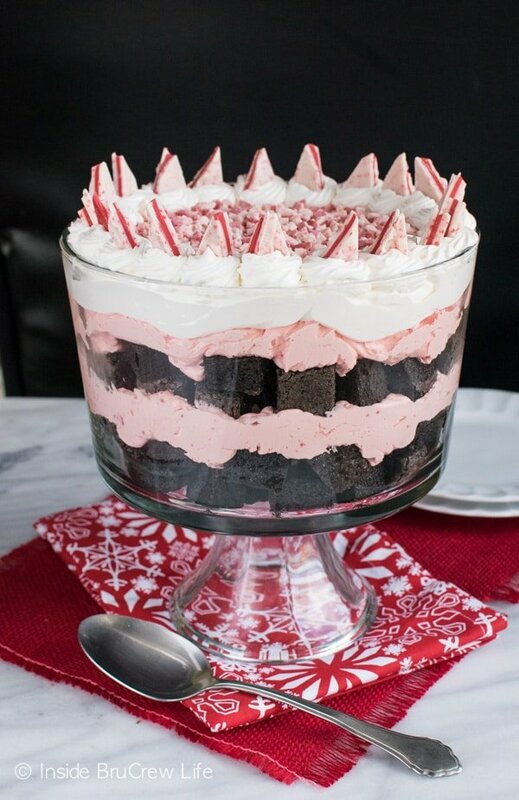 Layer the brownie cubes and no bake peppermint cheesecake in a large clear bowl. Top with more Cool Whip, peppermint crunch chips, and candy bars. 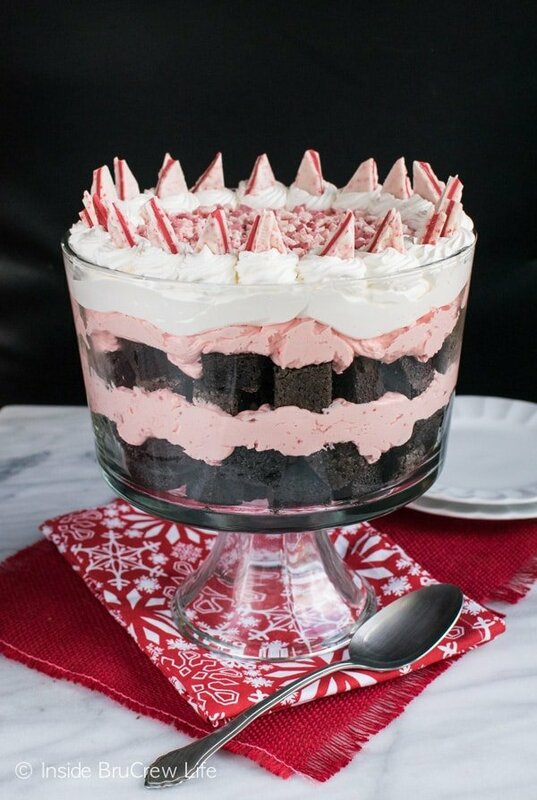 Layers of homemade brownies and a no bake peppermint cheesecake makes this Peppermint Brownie Trifle an impressive dessert to serve at holiday parties. Preheat oven to 350 degrees. Spray a 9x13 pan with nonstick spray. Melt the butter in a small saucepan. Whisk in the cocoa powder. Let cool slightly. Beat the eggs until light colored. Add the sugar and extracts and beat again. Stir in 1/4 cup of butter/cocoa mixture quickly. Add the rest of the butter mixture and beat again. Sift together the flour, salt, and baking powder. Slowly beat into the wet mixture in the bowl. Pour into prepared pan. Bake for 30 minutes. Do not over bake. Remove and let cool. Beat the cream cheese, sugar, and extracts until light and creamy. Set aside. Place 1 1/2 cups Andes peppermint chips and shortening in a microwave safe bowl. Heat for 30 seconds. Stir and heat again if needed until creamy. Pour into cream cheese mixture and beat until mixed in. Fold in half of the Cool Whip and 1/2 cup Andes chips. Cut the brownies into 1 inch squares. Place half the brownies in the bottom of a trifle bowl. 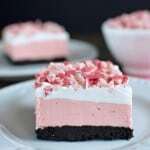 Top with half of the peppermint cheesecake. Repeat layers. Cover the top with the 2 1/2 cups Cool Whip and Andes chips. Swirl the last 1/2 cup Cool Whip around the edges with a piping bag and icing tip 21. Top each swirl with candy bar triangles. Keep refrigerated and covered until serving. 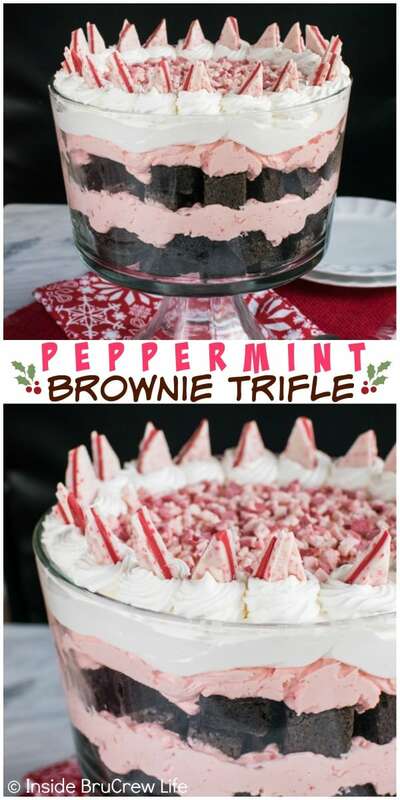 *The post and recipe for this Peppermint Brownie Trifle was originally published on December 14, 2015. The post has been updated and republished on November 29, 2018. 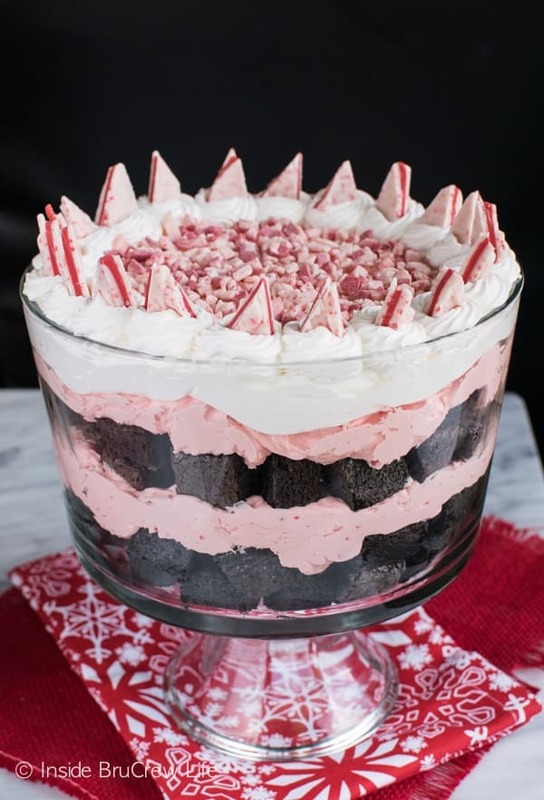 I had the pleasure of eating some of this delicious trifle at one of my bible studies, and it tasted so very smooth, and has the perfect balance of chocloate, creamy, and light peppermint crunch that just plain satisfies the cravings of a true dessert lover!!! It hasn’t really sunk in yet, that soon I am not going to have the pleasure of trying these hot off the press, and will need to bake all of them myself!!! Oh my word, this is the best trifle ever!!! I love those baking bits (and Cool Whip too, haha)!!! Those baking bits are the most convenient mint happiness ever invented in the baking industry. I love them! And Cool Whip, too. This is so wonderful! And if you’re talking dessert when you’re not working, it means you’re in the right line of work! 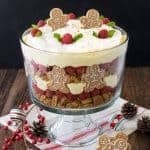 Trifles have been on my mind lately and this one looks to die for! What a festive dessert! Peppermint and chocolate are so yummy together! I have found green & chocolate Andes, but I cannot find the red/white. Any suggestions? I am excited to make this for our Christmas Eve dinner! I have had trouble finding the red and white peppermint crunch chips this year too. Target did have boxes of the peppermint mints that you could chop up into the chips. 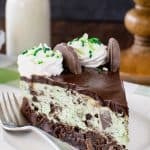 If not, the green Andes mints are a great replacement…it just would be layers of chocolate with the mints and chips on top. 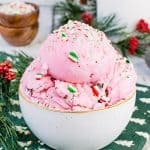 How do you think it would taste with peppermint kisses? I think the kisses would work just fine if you chop them up into pieces like the peppermint crunch bits. I hope you enjoy it! Keep me posted on how the kisses work for you! I have a dinner this evening and plan on making this. How far ahead can you make it? I don’t want it to run together. It will be fine to make it now for a dinner tonight! The trifle should keep for a day or two in the fridge too! Can you replace butter for shortening in this recipe? The shortening is just to help the chocolate melt a little better. You could try melting it with a little butter instead if you like. I hope you enjoy the trifle! This looks amazing, but I don’t ever use cool whip. 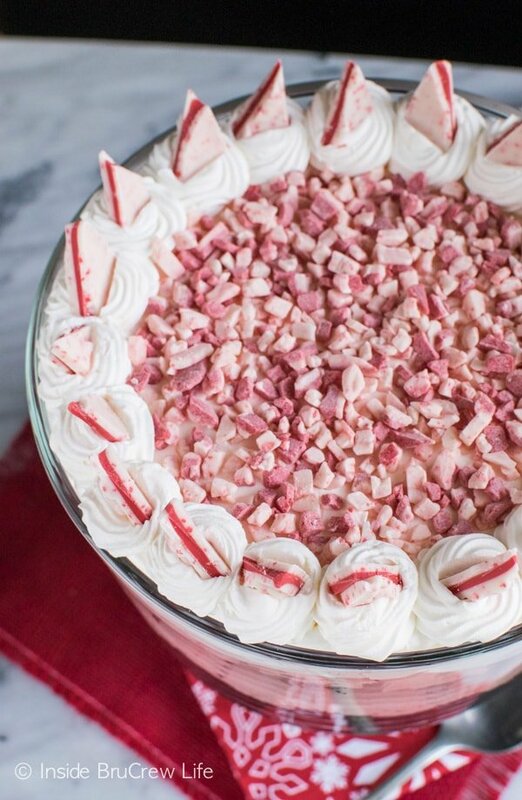 Can I substitute real whipped cream for this recipe? Yes, you can substitute a homemade whipped cream for the Cool Whip. I do recommend making sure it is a stabilized whip, so I usually use 1 cup of heavy whipping cream with 1/4 powdered sugar and beat it until stiff. That should make about 1 1/2-2 cups of whipped cream, so you would need to make more for this dessert obviously. The recipe calls for a 16 ounce container of Cool Whip, which is about 5 cups. could I make this today and then Assemble tomorrow evening? I don’t have time to make it tomorrow, but do tonight and it’s for a party tomorrow. Yes, you could totally make all the different parts and then assemble it when you are ready. It would also be fine to put together the night before and just add the top decorations at the last minute. I hope you enjoy it! I can’t find the Andes peppermint chips. I did find ghirardelli peppermint chunks. I’m wondering what the consistency of the Andes chips are. Are they soft like chocolate chips or crunchy? They have the consistency of chocolate chips. The Ghirardelli is a good substitute for them. I hope you enjoy it! for Step 7, do you fold in the Cool Whip and the 1/2 cup of Andes Chips into the cream cheese mixture? (step before) or is this the top layer of the Trifle? Yes, you are folding the Cool Whip and chips into the cream cheese mixture. Then in step 9 you will find the topping for the trifle. I hope you enjoy it!!! 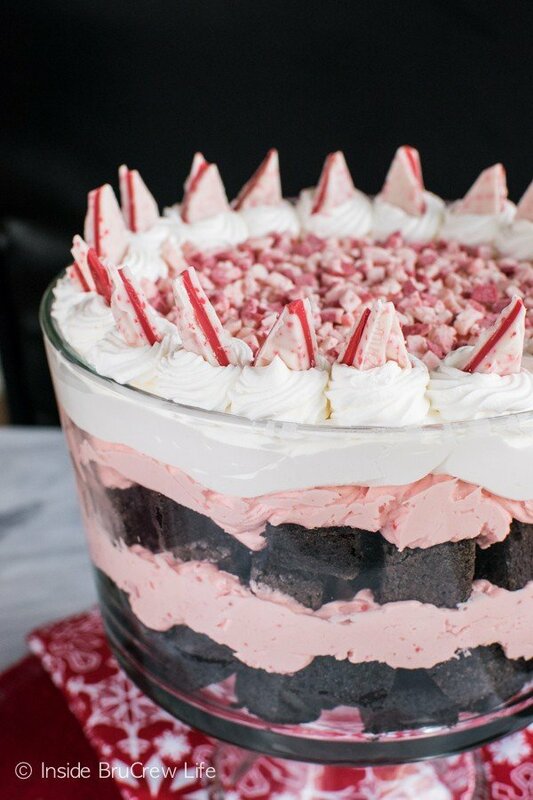 This is the prettiest trifle ever! 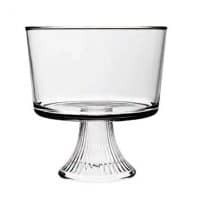 And so perfect for Christmas dessert! I made this for our holiday party and everyone LOVED it!!! Such a gorgeous dessert!! Perfect for the holidays!!! 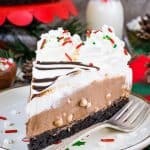 What a beautiful dessert.Making it for Christmas this year! This was such a showstopper! Everyone kept asking for the recipe! When using box brownies do you use one or 2 boxes? I usually bake a single box in a 9×9 pan not 9×13 so I want to make sure I have enough. For this trifle I bake a 9×13 pan of brownies. The recipe for the homemade version is in the recipe card, or you can buy a 9×13 box brownie mix. Either one works. Can I make this in advance? Like a day or two in advance? Yes, it should be fine made a day or two ahead of time. I hope you enjoy the trifle! 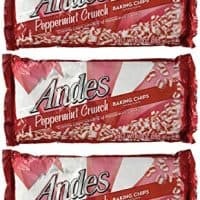 I have seen these Andes peppermint chips at our grocery store (Publix) and at Target this year. It is a peppermint white chocolate with little bits of peppermint pieces in it. Ghirardelli also has white chocolate peppermint chunks that would work too, but it will be white instead of pink. You can find those at the grocery store or Walmart. I hope you are able to find either one and enjoy the trifle. I had to buy them on Amazon because I couldn’t find them at the grocery store. Unfortunately, they force you to buy a minimum of 3 bags. I’m not quite sure what to do with the remaining bag that I didn’t use! What can I use as a replacement for shortening? I have none in the house and forgot all about getting some! You can also use a little bit of butter or coconut oil in place of it. It is just to thin the chips out a little when you heat them in the microwave.